So while we hint at it, we rarely ever talk about the mundane behind the scenes goings here at TechZim. Those in the know however probably know we, like over one quarter of the web rely on WordPress- as they say when you know you know so now you know. While we love WordPress and some of us will be attending the upcoming local WordCamp meeting, the hallmark of a good content management system is that it should be inconspicuous.Like a good CMS WordPress is often invisible until now. Now Gutenberg is coming. According to the dictator in charge of the WordPress project, Gutenberg is going to be just as revolutionary as its namesake, the original Gutenberg press. Saying that Gutenberg has polarised the WordPress community would be the understatement of the year. 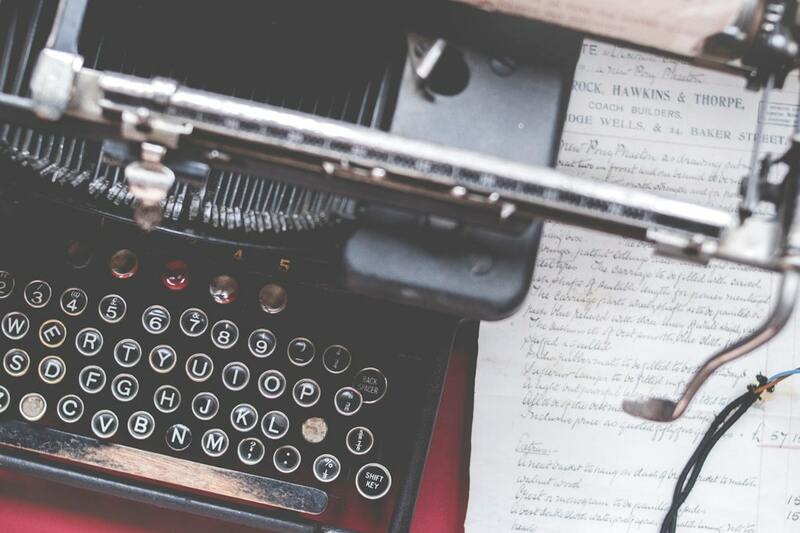 What in the name of FOSS is Gutenberg and what makes Gutenberg different? To those who have never used them or done so unwittingly, a Content Management System (CMS) is a piece of software that is used to create and manage content. A popular example is WordPress but there are other projects like the venerable Drupal and venerated Joomla projects. A CMS allows us for example to create an article in much the same way as you would say type out an Ms Word Document. The current editor has served WordPress well. It makes blogging accessible. A lot of people who learn computers are introduced to Ms Word which makes the transition from Ms Word a very simple affair. 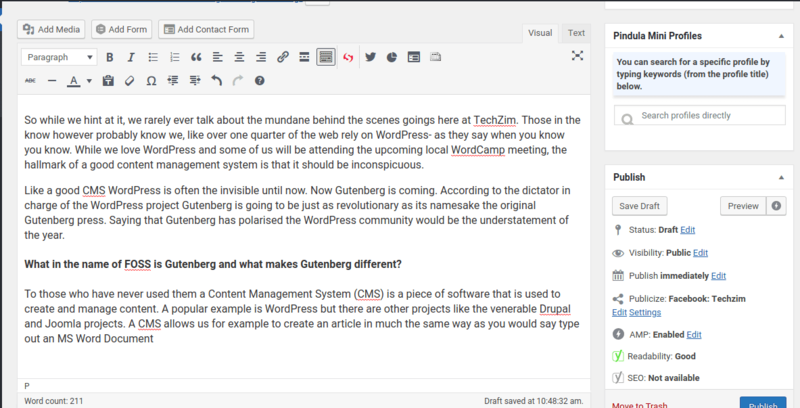 I would argue the current WordPress editor makes even the Microsoft Word Pad editor look like a complicated mess. It’s so easy more than 25% of the web swears by WordPress. The thing though is that the current editor comes with limitations. The biggest of these is that What you see is not exactly what you get. The only way you will know what your post will look like is to click the preview button and teleport yourself to the front end and put yourself into your reader’s shoes. Believe me that gets annoying quickly. Then there is the issue of flexibility: there are as many ways to create a post as there are recipes for making sadza and there are just as many ways to serve it all up. The new editor brings with it new aesthetics and more. At the heart of it all is the idea of blocks. Instead of endless paragraphs each “paragraph” will be treated as a separate block. You can style each block anyway you like. Blocks can be made up of something other than text. There are image blocks, product blocks if you run an eCommerce store and you can turn your cat or dog into a block too. Another important improvement is that with the right kind of themes (software that affects how your content looks) you can now actually see something close to what your readers will see right as you type it. Saving lots and lots of time. Gutenberg also does lots of other awesome things. Wrong. People detest change and there has been a lot of voices shouting against the Gutenberg train. The thing with Free Software projects is that most of them are run by dictators. Linux is run by a flippant thug called Linus Torvalds and Ubuntu by a shameless goon known as Mark Shuttleworth. It is an ironic thing like how most the countries that have the word Democratic in their name are anything but. Consider the Democratic Republic of Korea where democracy is treason. Well WordPress is run by Don Matt Mullenweg who just woke up one day and decided people needed to have Gutenberg never mind them saying they didn’t. A lot of people didn’t like it at all and there were a lot of complaints but one by one most of these have fallen in line. What the Don wants he gets but Gutenberg is an editor you can refuse – for now. All you need to do is to install the Classic Editor plugin which until Monday when WordPress 5.0 comes out, does absolutely nothing. After the update the plugin will keep your editor as it is and you can continue with your old classic WordPress nirvana. That is until 2023 when they cut the head off the horse by discontinuing the Classic Editor plugin. Then it will be Gutenberg or the highway. Correction release date has been pushed (again) to 27 November.